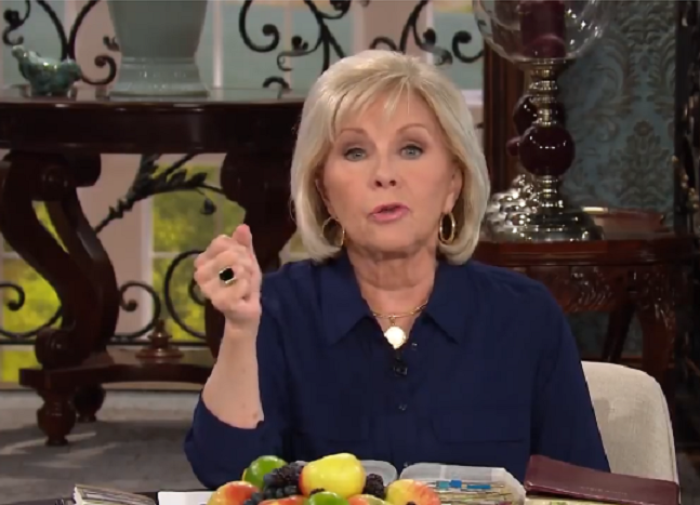 Gloria Copeland, co-founder of the Fort Worth, Texas-based Kenneth Copeland Ministries, has come under fire for urging her followers to avoid the lab-made flu shots because Jesus already gave them one that protects them from sickness. The criticism comes as at least 53 children have died from the flu this season and nearly 15,000 people have been hospitalized with the flu since October, according to the U.S. Centers for Disease Control and Prevention. "Well, listen partners, we don't have a flu season. We've got a duck season, a deer season but we don't have a flu season. And don't receive it when somebody's threatening you with 'Everybody's getting the flu.' We've already had our shot. He bore our sicknesses and carried our diseases. That's what we stand on and by His stripes we were healed," she declared in a now viral video posted on her ministry's Facebook page last Wednesday. Copeland, who was one of the evangelical ministers who advised President Donald Trump's presidential campaign, then proceeded to pray for those who were already suffering from the flu. She insisted after her prayer that those who follow Jesus have already been inoculated by Jesus. "Jesus himself gave us the flu shot. He redeemed us from the curse of flu and we receive it and we take it and we are healed by His stripes. Amen? You know the Bible says He Himself bore our sicknesses and carried our diseases and by His stripes we were healed. When we were healed, we are healed so get on the word, stay on the word. If you say 'well I don't have any symptoms of the flu' well great, that's the way it's supposed to be. Just keep saying that. 'I'll never have the flu, I'll never have the flu.' Put words, inoculate yourself with the Word of God," she said. Johnnie Moore, the unofficial spokesman for Trump's evangelical advisory council, told Politico Tuesday that the council did not support Copeland's position. "We don't agree with that statement," he said. "I don't know a single person in the White House who would agree with that." John Auerbach, president and CEO of Trust for America's Health and a former CDC associate director for policy, also told Politico that advice like Copeland's is "harmful." "It would be harmful to suggest that there is a non-scientific approach to preventing influenza particularly during a year where we're seeing serious illness and even an increase in flu-related deaths," he said. Many others also condemned Copeland's advice on social media while others asked questions about how to activate the holy protection from the flu. "Ok so if you get it does that mean you just didn't believe hard enough? I just don't understand it. God and Jesus never said bad things wouldn't happen to believers. What they both said was when bad things happen we will help you through it even when your child dies we will be there for you," Trayce Chambers, president of Affinity Advocacy in Texas, wrote. Kenneth Copeland Ministries responded: "No, if you get the flu, it does not mean you didn't believe hard enough. Thankfully, even if you get the flu, Jesus can help you overcome it. But many people go around expecting to get the flu, and declaring things like, 'It's flu season, and I always get the flu.' When you believe with your heart and speak words of faith in the flu out of your mouth, it's an open invitation for the flu to come in. Life and death are in the power of your tongue (Proverbs 18:21). So, instead of believing and speaking that the flu will come on you, you can exercise your faith and believe and speak that it will not. If however, you do get the flu, you can overcome it!" The ministry then shared scriptures to help believers stand against the flu such as James 4:7, which says "Resist the devil, and he will flee from you," and 1 Peter 2:24, which says "He personally carried our sins in his body on the cross so that we can be dead to sin and live for what is right. By his wounds you are healed."